Release and refresh! Join Lyndi for one of her signature restorative offerings. Restorative yoga is a luscious way to gently move and stretch your body. It offers a sacred pause in the midst of a busy life by allowing the mind the rest, the breath to deepen as the body is deeply rejuvenated. This offering will provide restorative poses held for 10-15 mins to assist in opening and nourishing the body, mind and spirit. This nurturing practice is the antidote to chronic stress, soothes the nervous system, supports immune function, and enhances one’s capacity to experience peace, serenity, and joy. A Yoga Nidra practice is included at the end the retreat to deepen cellular rest and rejuvenation. Affirmation, poetry, aromatherapy, and mudras will be used to reinforce revitalizing the body and spirit! Give yourself the gift of 3 hours of pure bliss!! These workshops will be limited to 10 people in order to allow more room, hands on support and additional props for each participant. WHERE: Yoga Is Therapy - 2921 E. Fort Lowell Rd Ste 103. Stress is the leading cause of disease (dis -ease). 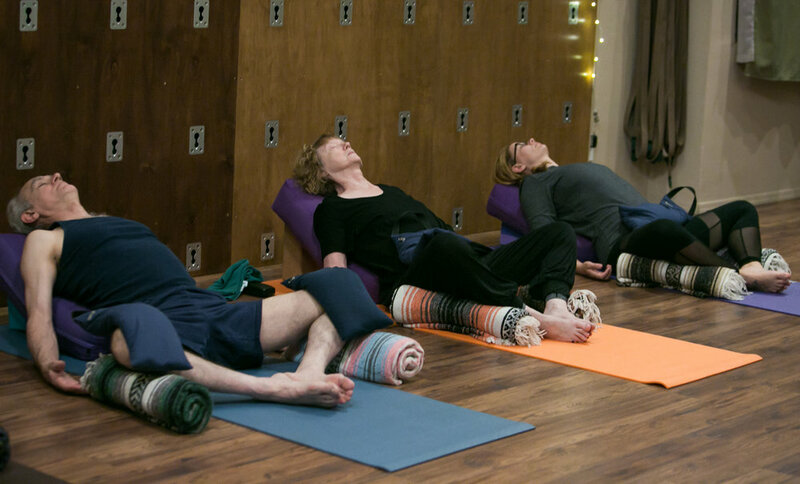 These classes includes Yoga Nidra meditation, gentle movement and restorative postures. Students are guided into poses they will remain in for 8-12 minutes with the support of props ~ bolster, block, blankets ~ in order to allow the body to fully relax. Class includes mudras, affirmations and essential oils to enhance the rejuvenation experience.